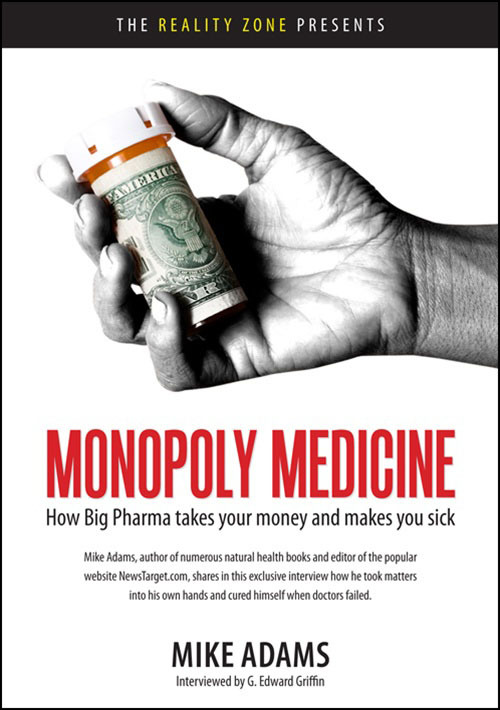 How Big Pharma takes your money and makes you sick Mike Adams interviewed by G. Edward Griffin Mike Adams, known as the Health Ranger to his fans, is the author of numerous books on natural health and editor of the popular internet site called naturalnews.com. Although self-taught, his knowledge of natural medicine is nothing short of phenomenal, as you will see from this interview. Be prepared for an enlightenment that could change your life. DVD, 107 minutes. TOPICS * How Mike cured himself when doctors failed. * Aspartame: The sweetest poison money can buy. * How Big Pharma controls the FDA. * Inventing mental disease to sell pharmaceuticals. * Modern medicine is riddled with junk science. * The cancer industry: A medical con game. * The best medicine contains freedom of choice. * The criminalization of vitamins by the United Nations. * The health crisis that looms ahead. * What you can do on your own to help. * Sidestep restrictions by growing your own medicine. * The importance of pH balance to optimum health. * The importance of sunlight to optimum health.